An early work of his influenced by Burne-Jones and tapestry works such as the San Graal tapestries designed by him and woven under the direction of William Morris. The son of a stained-glass artist he was educated at Brighton Grammar School where he was an exact contemporary of Beardsley. He went to Westminster School of Art (again like Beardsley) and then worked with his father for seven years as well as studying in Italy and France. His formalised style owes much to stained-glass (which continued until at least 1918) and the influence of early Italians, Puvis de Chavannes and Burne-Jones. He specialised in murals, doing work for a number of churches, war monuments and more secular projects. He exhibited at the RA (1895- 1923), the New Gallery and elsewhere. The beautiful Althea, dressed in a flowing robe of crimson lined with gold, approaches the prison of her beloved who reaches out though the iron grille to take a rose-bud from her fingers. The impregnable oak doors have long-since been locked and tender blooms have sprung up over the threshold; blushing campions and blue irises, trailing briar roses and delicate tulips. 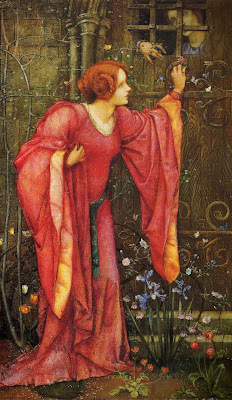 Althea's costume, with long sweeping sleeves, is similar to that worn by the Pilgrim of Love in a series of important pictures by Burne-Jones which includes Love and the Pilgrim (Tate Britain) and The Pilgrim at the Gates of Idleness (private collection). Frampton had been much impressed by Burne-Jones' work which he had seen at the New Gallery in various exhibitions. The son of a stained glass designer Frampton spent his formative education at Brighton Grammar School where his fellow pupil was the talented and tragic Aubrey Beardsley. He later attended Westminster School of Art before spending a period in his father's studio as an apprentice. It was here that he developed a flat and decorative style which owes much to early Italian art and also the paintings of artists like Puvis de Chavannes and Burne-Jones. He favoured romantic, religious and symbolist figurative subjects often depicting beautiful maidens in flowing gowns, painted in a rich style ‘sedulously wrought to the smallest, but never indifferent details.’ (Rudolf Dircks, ‘Mr E. Reginald Frampton’, Art Journal, 1907, p. 295) Frampton followed in his father's footsteps, producing designs for stained-glass well into the twentieth century. He also undertook several important commissions for decorative schemes in churches in Hastings, Ranmore and Southampton. His work was shown at the Royal Academy, the Art Worker's Guild and the New Gallery. His work was also appreciated in Europe following the successful exhibition of his work at the annual Paris Salons. His richly decorative scheme which reflects the advances of the Arts and Crafts Movement, can be seen as embodying the exotic medievalism which had swept the continent in various guises for several decades.